Running registered Sandboxie 4.02 (can verify if needed). NOTE 1: Adobe Photoshop 7 work fine in my other sandboxie. NOTE 3: Tried installing to default folder. Same error! 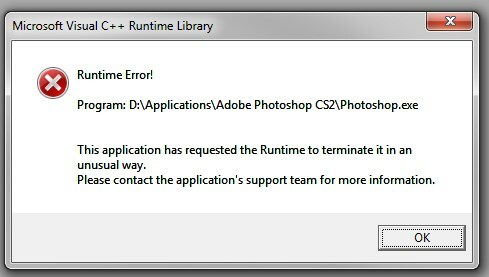 Here are some error messages I get when running Photoshop CS2 in sandbox. I have tried in Defaultbox and it still doesn't work. Note: I did not look into it or fix anything in version 4.03.02. I am asking you to check if it happens to already fix the problem. I ran latest version; same problem. I added * to the window class as you suggested -- still happens. I tried to install Photoshop CS2, but it wants a serial key, so that was as far as I got. Sorry! 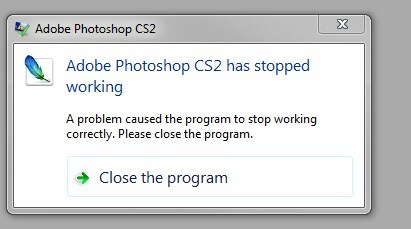 tzuk wrote: I tried to install Photoshop CS2, but it wants a serial key, so that was as far as I got. Sorry! Adobe has released the legacy version of CS2 as freeware. soccerfan wrote: Adobe has released the legacy version of CS2 as freeware. Last I tried (3.76) the problem had something to do with loading its UI fonts. Should be fixed in version 4.03.04. I will note that it seemed to me that version 3.76 exhibited the same problem showing the same "runtime library error". Works for me now. Thx tzuk!!! And thank you soccerfan for the free serial to check with.